Pro-fluoridation organizations need to have a better presence on the Internet and utilize social media to educate the American people about the facts on fluoridation. Individual dental and health practitioners need to educate their patients about fluoridation, so their patients will not be easily misguided by misinformation on the Internet and social media. And, of course, these lessons are just as applicable to New Zealand. 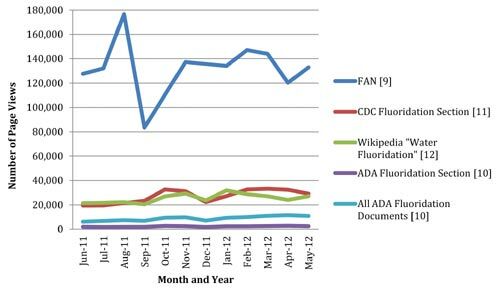 They monitored website traffic for major fluoridation websites from June 2011 – May 2012 and fluoridation information on Facebook on April 3, 2012. In addition they collected search data for the term “fluoridation” on Twitter for 2 periods (March 1 – 14 and April 1 – 14, 2012) and on YouTube for April 3, 2012. I illustrate some examples of the data presented in the figures and tables below. This figure shows that the most important anti-fluoridation website, Paul Connett’s Fluoride Action Network, had far more traffic than the Wikipedia fluoridation section and the institutional web sites (which are pro-fluoridation) on fluoridation. The Twitter search also showed far more anti- than pro-fluoridation tweets, although the data shows the numbers are influenced by important articles. 1: This study is a snapshot in time. For example, Table 1 would look a little different at this time (January 2015) than it did in April 2012. There are now a number of specifically pro-fluoridation, or at least uncommitted Facebook pages and groups. My brief search for Facebook “pages” and “groups” using the words fluoride or fluoridation showed about 8 pro-fluoridation, or neutral, pages in the first 50 results for “fluoride” and 2 for “fluoridation.” There were about 4 “pro” Facebook groups in the first 50 for either of these two search terms. Things are improving. In New Zealand we have seen an increased activity of pro-science groups since the undemocratic decision (now reversed) of the Hamilton City Council to stop fluoridation. This was under pressure from anti-fluoride activists (nationally and internationally) and against the expressed wishes of the citizens. Similar fight-backs are happening overseas – in USA, Canada, Ireland and the UK. The progress is welcome but more is required. Although I should note there is a tendency for anti-fluoridation activists to set up Facebook pages for many locations where there may have been suggestions of campaigns but the pages become inactive in a short while. 2: Who is financing these anti-fluoridation websites and social media activity? There is a clear connection between the “natural” health industry and anti-fluoridation organisations and activity. Paul Connett’s Fluoride Action Network is organisationally connected with Mercola’s “natural” health business (and anti-vaccination groups) through the “Health Liberty” organisation and financial flows from Mercolla to FAN are well known. Similarly in New Zealand the “natural” health industry, through the NZ Health trust, has financed legal action of anti-fluoridation groups (see Who is funding anti-fluoridation High Court action? and Corporate backers of anti-fluoride movement lose in NZ High Court). 3: Is there an underlying purposeful strategy behind then internet and social media anti-fluoridation activity? Definitely. I gave an example illustrating this in Anti-fluoridationist astro-turfing and media manipulation. Activist groups will create press releases pretending to be scientifically authoritative. These are picked up by the “natural” health web sites and magazines (and sometimes, if they are lucky) by the main media. They get coverage on Facebook pages and are tweeted – often automatically by internet bots and the web sites themselves. They can easily create “Twitter storms” this way and widely spread their misinformation. trutherbot ‏@trutherbot: Naturally occurring fluoride is not used in any fluoride practices. Only industrial waste is used. And, the misinformation cycle gets repeated. Information on Twitter gets reproduced in blog comments and included in web sites and press releases. 4: Institutional web sites are not really suitable for this sort of debate on the internet and in social media. This is partly the problem of a serious, rational or logical web presence challenging an often emotional web presence. A calm explanation of the science challenging claims appealing to preconceived prejudices and emotional needs. Also, institutions traditionally have felt such debates are somewhat “below” them, preferring not to get into what they see as “street-fighting.” Recently I heard of a case where an anti-pseudoscience group had asked permission to use material from a professional dental site for use in a booklet. They were turned down because the association could not see why this was necessary! This suggests that pro-science activists should consider taking the initiative, launching their own web sites, etc., and participating in these sorts of struggles, rather than relying on existing institutions. Similarly such activists should see they can play a far more active role on Facebook and Twitter than institutions can, or a willing to. This study shows that people are in general being misinformed by social media and the internet about community water fluoridation. I suggest this is not accidental – political and business interests are actively encouraging this misinformation. In particular, the “natural” health industry plays a key role in promoting misinformation on fluoridation. Recently things are improving a little with a fight back from pro-science groups and individuals. I suggest their activity is essential as institutional groups and media outlets are not suited for internet and social media debates. Update: The National Fluoridation Information Service today responded to the NZFIS press release to make clear that it did not originate from them (see 27.08.13MediaReleaseFinal). The recent attempt by anti-fluoridation activists in Hamilton to limit the ability of academic scientists to comment on the fluoridation issue seems pretty dishonest (see Anti-fluoride activists attempt to silence science). Especially with the upcoming referendum. But that isn’t the only dishonest tactics these anti-fluoridation activists get up to. They are also involved in very cynical manipulation of press releases, the media and the establishment of front organisations – astro turfing. A recent press release for the NZ Fluoride Information Service (NZFIS) surprised some people – including even very senior members of the Fluoride Free organisations (see screen capture below). It even fooled at least one give away newspaper, The Hamilton News, into reporting their press release as a “story” (see Fluoride group praises council). Bloody hell, any objective observer of the submissions made to that “tribunal” couldn’t possibly agree. Who the hell are the NZ Fluoridation Information Service? Surely they aren’t the body set up by the Ministry of Health tasked with providing updates on current fluoride research – the National Fluoride Information Service? (An organisation well worth following for updates on the science behind fluoridation issues). Well, no, but the names are similar enough to confuse the less informed observer (and some senior members of the Fluoridation Free groups). The National Fluoride Information Service (NFIS) is an information and advisory service supporting District Health Boards and Territorial Local Authorities by providing robust and independent scientific and technical information, advice and critical commentary around water fluoridation. In contrast the NZFIS is, in fact, a front organisation for the Fluoride Action Network of NZ (FANNZ) – the anti-fluoridation activists. They claim to be an independent body providing objective advice and also claim to have “been created by independent experts in this subject. The Service includes scientists, doctors, dentists, and lawyers. It has direct access to many international fluoride researchers.” But this is just typical of they way anti-fluoridations claim their spokepersons are experts. The “founder and science and legal advisor” for the NZFIS is Mark Atkins. He is also the “Science and Legal Advisor“ for FANNZ management committee – so much for independence. 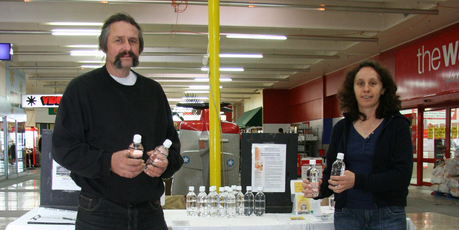 Mary Bryne, who is the National Co-ordinator and media contact for FANNZ is works closely with Mark Atkins in FANNZ, and probably also the NZ Fluoride Information Service. So the NZ Fluoride Information Service is not an “independent” organisation – it is just a blatant example of astro-turfing. So poorly done that they mix their spokespeople and use the same postal address. And then the local Fluoride Free groups circulate and publicise press releases from the NZ Fluoride Information Service as if they have originated from independent sources – sometimes media organisations even reprint them. Pure media manipulation. 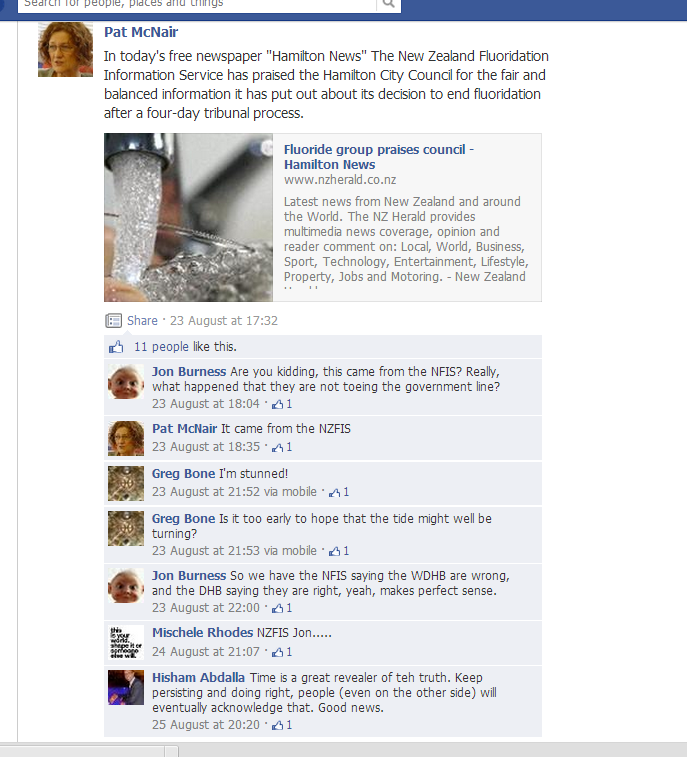 Fluoride Free Hamilton posts the NZFIS press release on its Facebook page as if it is independent – and fools some of its members. Frankly I think that sort of behaviour is unethical.